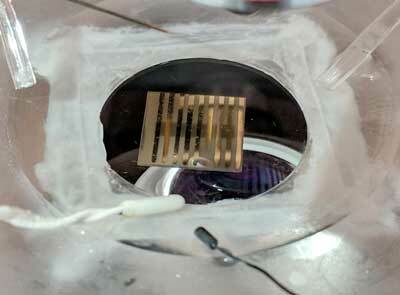 (Nanowerk News) What if the brain could detect its own disease? Researchers have been trying to create a material that "thinks" like the brain does, which would be more sensitive to early signs of neurological diseases such as Parkinson's. In a study published in Nature Communications ("Perovskite nickelates as bio-electronic interfaces"), researchers demonstrate the ability of a quantum material to automatically receive hydrogen when placed beneath an animal model's brain slice. Quantum means that the material has electronic properties that both can't be explained by classical physics, and that give it a unique edge over other materials used in electronics, such as silicon.